The Refuge is a land of towering mountains, active volcanoes, broad valleys, fjords, tundra, and glacially formed lakes. Celebrate the 50th anniversary of the Wilderness Act! Alaska refuges contain more than 18 million acres of these spectacular lands. Alaska Peninsula's diverse, wild habitat is vital to birds migrating from North America, Asia, and even farther afield. 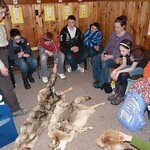 Customized environmental education programs get students outside to learn. Dolly Varden char, lake trout, five kinds of salmon, Arctic grayling, and other fish can be caught in scenic locales. Field Notes showcases the recent activities and accomplishments of the refuge. To find out the latest happenings on the Refuge visit our Field Notes Feed. Alaska Peninsula National Wildlife Refuge is managed as part of the Alaska Peninsula/Becharof. 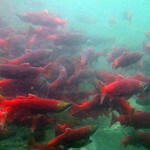 Many of the salmon from the world’s most valuable sockeye salmon fishery (Bristol Bay) spawn in the streams that originate on Refuge lands.